Giovanni’s Ristorante is upscale Italian, located in the lobby of an nondescript office building in Beachwood. While first impressions may not be much, walking through the carved double doors reveals something quite different. We went for lunch, when it’s a little more laid back, but ordinary dinner dress is jackets, so it’s definitely on the fancier side. They recently underwent a renovation, so the dining room was crisp and clean. Don’t bring your younger kids (unless they’re extraordinarily well-behaved and can sit still and quietly for extended periods of time, in which case I’d like to know how you do it). Being a mid-week lunch, it was a rather casual affair – no starters or desserts. S, as she often seems to, ended up ordering a gnocchi. 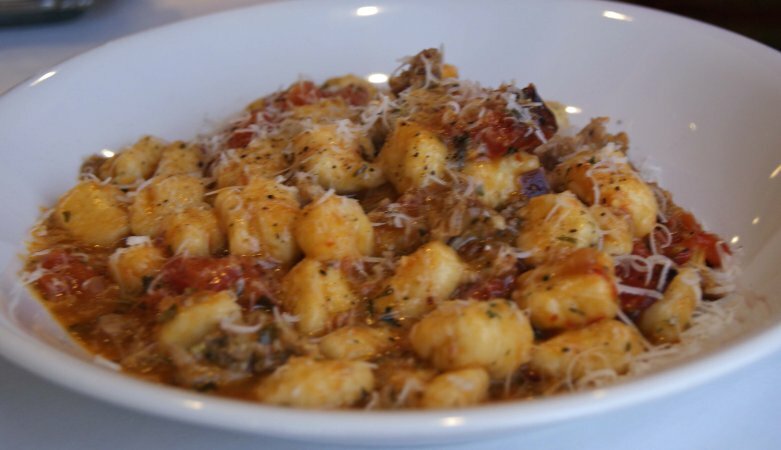 She let me try some, and I noted that it was very light for a gnocchi – most of them are usually pretty dense and fill you up after about a half-dozen. These were not, and provided a nice base for the meat and sauce. 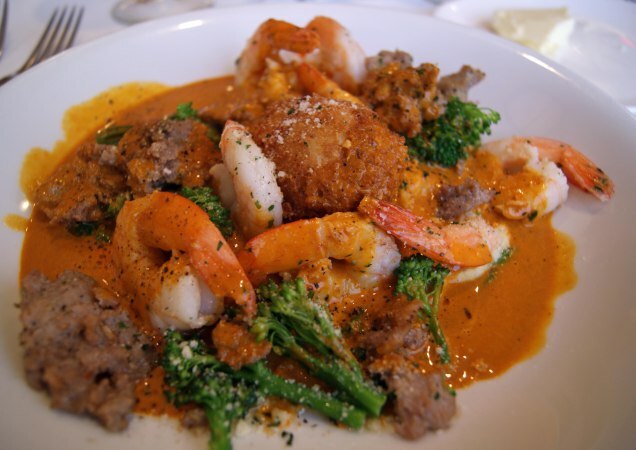 I tried the shrimp diavlo – a spicy shrimp and sausage dish served over creamy polenta, and accompanied by a battered and fried hard-boiled egg, something I’ve never before had. The sauce did have a kick, but was nothing overpowering, and the shrimp were done just to the point of being done, and not too tough. The verdict: Giovanni’s earns 5 1/2 stars out of seven. The food was very good, but not outstanding. Service was good, and prices were a bit higher than a normal lunch menu ($15-19), but were expected given the caliber of the restaurant. Since it was lunch, we probably didn’t get the full experience, and looking at the dinner menu, we’d certainly like to return someday.